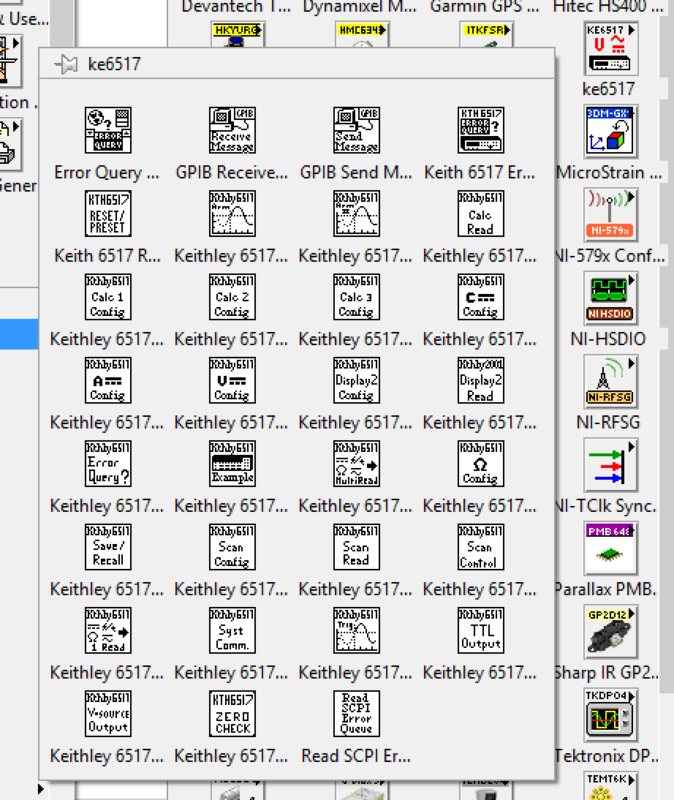 I am having some questions about the Labview VI for the Keithley 6517b model. I want to measure very low currents continously so I build a VI. I use the DCI config VI to put the keithley in current measurement mode and then while-loop over the multi-read vi. The multiread-vi has an input called count-value. What does this input do as it's smallest value is 2 and not 1? Does it coordinate the number of measurements the keithley takes for one measurement-point? e.g. with having a value of two it takes two measurements and then takes the mean out of them both? It would be nice if you could provide me some info. Another question I have is if it's possible for the keithley to give me some uncertainty? When the keithley really averages over several measurements then I need the statistical uncertainty for each measurepoint. As you may see now what I'm looking for is a deeper understanding of how the keithley generates it's measurements. I attached the VI. #measurements is the input for count-value as mentioned earlier. I hope you can help me and many thanks in advance. What driver are you using? I cannot successfully open this VI. Well I dont exactly know what driver version it is as it is only lasted as 'ke6517' in the instrument drivers section. But heres a quick screenshot of the VI's if that helps you. I've been building another continous readout VI with those newer drivers. But honestly I think that the old drivers work much better. I've attached a continous readout VI. What bothers me is that its refreshrate is very low. Even if i change the timer in the while-loop to 1ms. Also can you tell me how the keithley acquires measurements? Where can I get the standard derivation for each measurepoint? All I am getting from the Read Measurement Data.vi is a cluster with the measurement as a double, units, time stamp & date, reading #, channel #. But I'd like to see some uncertainty. PS: I've put the VI in my dropbox as I cant attach it to this post for some reason? Another thing that bothers me with the new drivers is, that when you use my continous readout vi and make a measurement. It works fine but if you stop the measurement and and to retake another one the keithley gets locked. The keys on the panel are not usable as well as it does not respond to the labview vi anymore. It's completely frozen. I think that it is internally locked by some scpi command but I dont know how to unlock the keithley. alright, fixed the locking with adding the preset vi right before the closing vi.